For the last 3.0 kick-off in 2016, we had a calm, still day, with conditions underfoot ideal and a local derby game to whet the appetite. ‘Ensians gave their supporters a good afternoon and a solid (all subs used) team performance provided excellent defence, strong turnover work and counter attacks of the first order. Pythons were given a tough day at the office and it was slightly disappointing for the home side that after a half time bonus- point lead of 24-0, concentration dipped and Harrogate were able to post 19 points in the second session. There was not much to complain about from the match as a whole though, refereeing control was fair and firm and with minimal injury-stoppage time, we had pretty well a full 80 minutes worth. After the visitors controlled possession and field position for the first 10 minutes, ‘Ensians tackled well, gradually frustrated them and then “found” the ball. Breaks by Luke Cowdell and then Sam Featherstone plus turnover ball saw them camped in Harrogate’s 22 and finally Cowdell took his chance to power in almost unopposed between the posts. Connor Bateman made no mistake and after virtually 10 minutes defending, the home side were 7-0 to the good. From the kickoff, ‘Ensians secured the ball and scrum half Rob Lofthouse broke, made a good 40 metres before being hauled down and isolated due to lack of support. The inevitable holding-on penalty resulted, but possession was quickly regained and swift, slick passing gave Ollie Eaves chance to run strongly to the left corner. Bateman’s conversion attempt fell short, but 12-0 and running their opponents around, the men in blue were enjoying themselves. Some careless passing, crooked throws into the lineout and Harrogate not able to make much ground, slowed the game down a little, and two missed touches from Python kicks did nothing to help them. Turnover ball and good handling saw Bateman in space and he ran freely and fast to the corner. Cowdell relieved him for the chance to add the extra points, but didn’t strike as well as he had in the warm up and the kick was well off the mark. 20 minutes gone, 17 in front, home supporters happy! We then had some kicking ping-pong and the home side were defending in their 22. A kick to clear missed touch, Pythons ran back and were themselves awarded a penalty for ‘Ensians offside. However, a turnover in midfield gave the ball back to the Old Boys and this time, after handling well, the threes put winger Bateman into space again and he ran in under the posts. The bonus point secured, Bateman converted and 24 unanswered points looked healthy enough. Ollie Eaves broke down the left, but yet another penalty conceded gave Harrogate chance to breathe again. They were struggling, though, in the face of some hard tackling and an inventive short lineout saw John Offer make good ground and put them on the back foot again. Josh Howarth had a couple of runs, rucking was excellent, but loose passing and ill discipline spoilt ‘Ensians’ play at this stage. Defending in their 22 just before half time, the home side gained a penalty award and cleared to get to the break with a comfortable lead. Bateman and Featherstone featured well after the restart with the former beating three men before being tackled and shortly afterwards missing out on a hat trick through a loose pass. 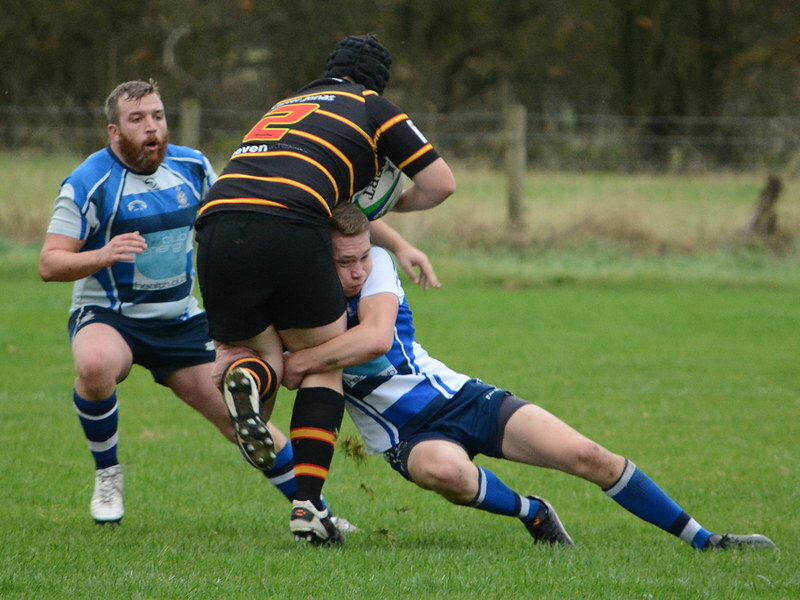 However, Harrogate began to run with more purpose and pressed hard during a rare visit to the opposition 22. A driving maul by Pythons, a free ball, back for the penalty, into the corner, ‘Ensians up against it. A further penalty conceded by the home side was risking yellow card territory, and after 10 minutes, Harrogate’s scrum half broke, was too quick for the defence and fed his supporting winger for a try in the corner. A beautiful left-footed touchline conversion put Pythons on the board at 7 points and it was time for ‘Ensians to reassert themselves. A nice Bateman penalty quickly did that but then ‘Ensians were again pegged back in their own 22 before a superb 40metre clearance kick by Cowdell took them into the “right” half of the field. Kicking away possession seemed to become a feature, but a good chase kept ‘Ensian pressure up. After 25 second half minutes, Featherstone, acting as scrum half, made a lovely break, kicking ahead worked and following lineout possession, pick-&-drive, Ieuan Cranswick produced a classic centre three-quarter run to go in close to the posts. Bateman would put his failed kick behind him!! 32-7. Five minutes later, stand off Will Cooper put his name on the score -sheet, Bateman converted and some five minutes after that, Nick Keinhorst added another try which, brilliantly improved by Bateman, took the tally to 46 points. Enter Harrogate Pythons! :- Tries after 35 and 40 minutes, one converted, gave them some respectability and the match, fairly and spiritedly played, finished at 46-19. ‘Ensians don’t always beat the Pythons, so the clubhouse enjoyed the moment before Haloween took centre stage.